I have a community based work background, both within the voluntary and statutory sectors and through working in gallery education. I have worked with a number of galleries and arts organizations such as Whitechapel art gallery, Milton Keynes gallery, engage, Chisenhale gallery and ACAVA. At Milton Keynes Gallery I worked with a group of visually impaired adults to make their own exhibition and installation inspired by contemporary art in the gallery. 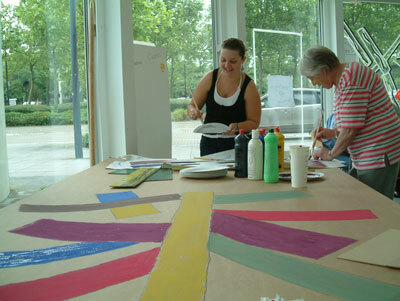 Two of the participants, Tessa and Eileen, painting at the Milton Keynes Gallery. At the Whitechapel I worked regularly as artist facilitator to deliver and develop art workshops for visually impaired people and people with mobility needs. I took part as an artist on the "Get Art!" project for the Chisenhale Gallery, working with children with learning disabilities in the borough of Tower Hamlets. I took part in research for "Get Art!" Bristol, which was also lead by the Chisenhale.